The top three telecom operators have managed to guard their subscriber market share in 2017 against the onslaught of Reliance Jio but revenue and profitability have eroded substantially, leading to about 19 per cent decline in the industry’s adjusted gross revenue (AGR). According to the yearly report of the Telecom Regulatory Authority of India (Trai), the average revenue per user (ARPU) per month in the industry declined to Rs 81.39 in 2017 against Rs 118.65 in 2016. A striking thing in the composition of ARPU in 2017 is the decline in voice share. In 2016, when the ARPU of the industry (GSM) stood at Rs 118.65, revenue from calls was Rs 59 but has decreased to Rs 32.08 in 2017. Revenue from data usage remained constant at Rs 27.50 in 2016 as well as 2017. The ARPU of Rs 81.39 is of GSM service, which constitutes the majority of wireless subscribers at 1,162.20 million in 2017. CDMA technology, which has almost become extinct with only 5.24 million subscribers left in 2017, has an ARPU of Rs 120 per month. The drop in voice revenue can be attributed to the popularity of the operators’ bundled plans. The other reason for the ARPU drop was lower roaming revenue and decreased interconnection charges for incumbents. According to the numbers available for the March quarter from companies, Jio’s ARPU was the highest in the industry at Rs 137. Airtel’s ARPU was Rs 116 whereas Idea’s was Rs 105. Vodafone has not yet declared its March quarter numbers. Recently, the Cellular Operators Association of India (COAI) made a presentation in which it said voice realisation had fallen to 19 paise per minute by September 2017 from 33 paise per minute in September 2016. Voice realisation might have fallen further after that but there is no data to compare because operators have stopped sharing voice and data realisation figures owing to their offering bundled plans. Trai said in 2017 the composition of ARPU declined in all segments except average revenue from data usage. Though revenue from voice has decreased, usage has increased immensely. Average minutes of usage per subscriber per month increased to 441 during 2017 as against 370 in 2016. Though the big operators have retained their subscribers and market share, they have bled in terms of profitability. The telecom industry’s AGR declined by more than 19 per cent to Rs 1.60 trillion in 2017 from Rs 1.98 trillion in 2016. As licence fees and spectrum usage charges (SUCs) depend on an operator’s AGR, the licence fees collected for 2017 declined to Rs 129.76 billion from Rs 159.75 billion in 2016. Similarly, SUCs declined to Rs 50.89 billion in 2017 from Rs 75.74 billion last year. The disruption caused by Jio in 2016 can be gauged from the fact that it added 72.16 million subscribers in just over three months, securing a wireless market share of 6.40 per cent at the end of December 2016. However, 2017 was different as incumbent operators had realised that it was a do or die situation and followed Jio in matching its tariffs, which allowed them to retain their market share, though at a substantial cost. 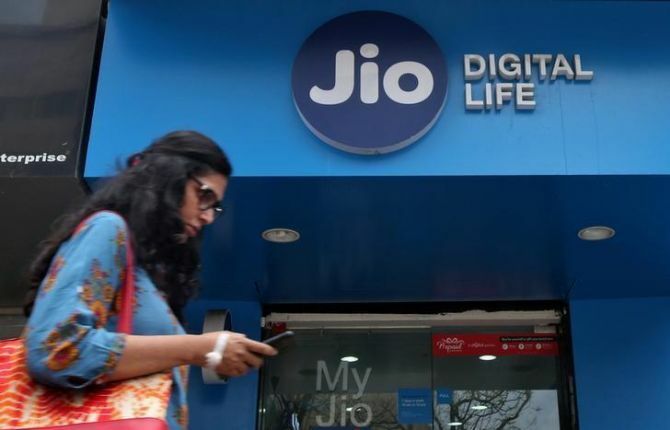 The three top incumbent operators - Bharti Airtel, Vodafone and Idea Cellular - have taken the onslaught from Jio well at least in terms of subscribers. According to Trai, in 2017, Airtel and Vodafone increased their market shares whereas Idea Cellular retained it. In 2017, Airtel added 24.26 million wireless subscribers at a growth rate of 9.13 per cent to end the year with 290.11 million. Vodafone added 7.84 million and kept a growth rate of 3.83 per cent. Idea added 5.98 million with 3.14 per cent growth. Jio’s growth rate was, however, steep at 121.86 per cent and it added 87.93 million subscribers. State-run BSNL too added 11.13 million users with a growth rate of 11.50 per cent. BSNL comes second only to Jio in terms of subscriber growth, a sign that the state-run company means business and will not cede market share to competition easily. Apart from subscriber additions, the pattern of market share changed drastically in 2017. The biggest losers were Reliance Communications, Tata Teleservices, Telenor, Aircel and MTS, which either closed down or merged.